Sunflower oil, and the related safflower oil, are used as cooking oils in cultures around the world. They are both polyunsaturated oils and are healthier than either corn or soybean oil. Safflower and sunflower cultivation is widespread throughout the United States. Both safflower and sunflower oil have the benefit of being polyunsaturated. This means that they both have more than one double-bonded carbon per molecule. This type of fat remains liquid at room temperature and when chilled. Polyunsaturated fats also have health benefits. Because they are rich in essential fatty acids such as omega-3 and omega-6, they can help lower cholesterol levels and reduce the risk of heart disease and stroke. The sunflower is not actually a single flower, but a cluster of hundreds of tiny flowers. The oil is removed from the seed using steam extraction. As a cooking oil, sunflower oil has a delicate taste and is good for frying and baking. Sunflower oil has a higher content of vitamin E than any other vegetable oil, including safflower oil. Sunflower oil is available in three varieties. Linoleic sunflower oil is original sunflower oil and has low levels of saturated fat as well as being rich in vitamin E. This variety is 65 percent unsaturated and rich in the essential fatty acid omega-6. High Oleic sunflower oil rich in monounsaturated acid. It is used in baking, as a spray oil and in non-dairy creamers. 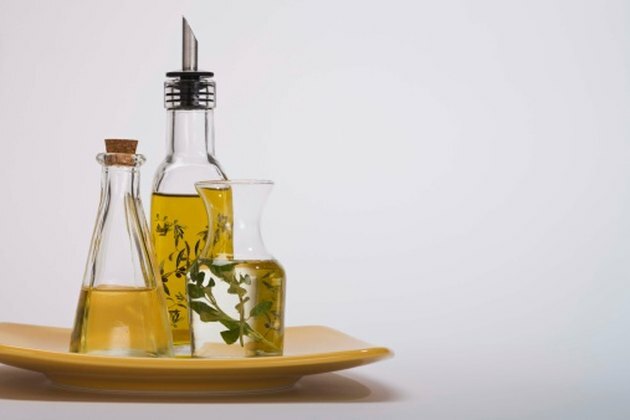 This type of oil can lower cholesterol and triglyceride levels. NuSun sunflower oil is a new variety which has been created by the National Sunflower Association to meet the growing needs of the food industry. This variety has lower saturated fat levels than linoleic sunflower and higher oleic levels, making it slightly healthier. Safflower oil is removed from the seed using steam extraction. Safflower oil has only two varieties. One is a linoleic variety, which is rich in polyunsaturated fatty acid. The other is an oleic variety that is rich in monounsaturated fatty acid. Both varieties are very low in saturated fats. Though it doesn’t quite beat sunflower oil, safflower is lower in saturated fat and higher in monounsaturated fat than olive oil.